Auggie Pullman is the star of Wonder by RJ Palacio, although not the only narrator of this layered, deeply moving, incredible book. Auggie is a ten-year-old boy who lost in the genetic lottery and was born with a number of facial deformities and related complexities, but no other handicaps beyond the way that peoples' reactions and responses to his physical appearance make his life difficult. Several year's worth of operations have improved Auggie's quality of life, if not his appearance, and he is a healthy boy with a sharp mind, a great sense of humor, a passion for all things Star Wars and a loving, thoughtful, protective family. After years of homeschooling, Auggie's parents decide it's time to think about sending him to school and go through the application process to enter him in the prestigious Beecher Prep school just down the street from their New York City home. When Principal Tushman handpicks three students to act as ambassadors (and hopefully friends once the school year starts) and give Auggie a tour of the campus a few weeks before the start of classes, he sets in motion a story of prejudice, lies, bullying, bravery, apologies and forgiveness that initially circles around Auggie but, as the story unfolds, comes to encompass everyone in his orbit. On the surface, Wonder is an uncommon story about a unique boy, on the whole, Wonder is a universal story about how it's not always easy to love another person, for any number of reasons, but when you do, the rewards are so much greater than sadness, pain, loneliness, and hard work that it sometimes takes to connect with someone else in this world. Palacio makes her story of an outsider trying to fit in a universal story by examining the lives of Auggie's classmates, his sister and her friends and former friends. Palacio divides the book into eight parts, three of which are narrated by Auggie. Every few chapters a different character takes turns narrating the story, sometimes overlapping with Auggie's narrative, often providing insight that deepens and expands the story. Via, short for Olivia, is Auggie's older sister, and she takes up the narrative after Auggie. At fourteen, Via barely remembers life before Auggie but she also has a profound understanding of how his existence has shaped hers. In a way, her narrative is almost shocking after the sweet, knowing narrative of Auggie. While she loves her brother completely and would do anything for him, Via also, heartbreakingly, understands the he needs and even deserves the lion's share of attention, effort and exertion on the part of her parents and she has learned to live accordingly. She never asks for help with her homework but teaches herself. She understands when her parents can't attend her sporting events or school recitals. She is reading War and Peace and enjoying it. She is excited to be starting ninth grade at a new high school across town where no one knows she is the sister of the deformed boy. But, as the first day of school approaches and she finds herself abandoned by her two oldest, closest friends, the pressure of her life begins to get to her. As Via struggles with social situations, old friends, and new friends at her new school, Auggie goes through parallel, although sometimes more harrowing, situations. Palacio inhabits the narrative voices of her characters, teen and tween, boy and girl, wonderfully and they ring true, a major accomplishment in a middle grade novel. 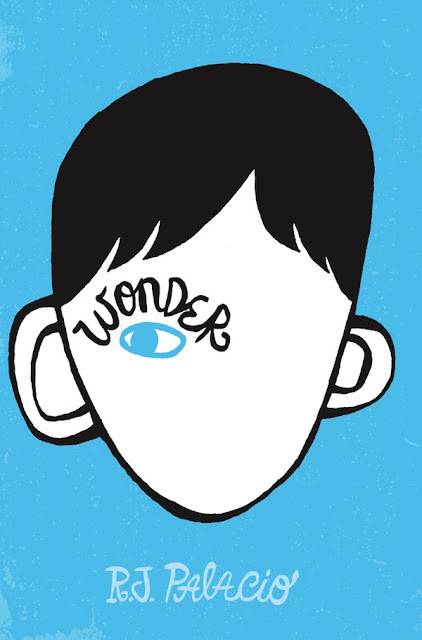 Like Maria Russo, who reviewed Wonder for the New York Times in April of this year, I sobbed often as I read this book, and not just during Auggie's narrative. But, like her nine-year-old daughter who loved the book and pressed it on her friends, I think most kids will remain dry eyed. What adults may respond to is the wonder of the love and ability of the Pullman family to endure the struggles that Auggie's facial disfigurations have put all of them through with warmth, humor, graciousness and gratitude. This is one (rare) book where the main characters (although not all of the other characters) do not endure hardships because of neglectful or absent parents but instead have parents who create an environment in which they believe and trust that they can surmount their problems because they are supported and loved. 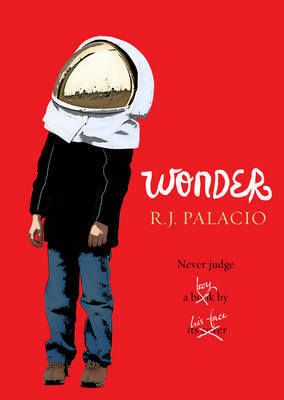 While I think the cover for the US edition of Wonder is FANTASTIC I also really like the UK cover, which references some really nice aspects of the book. Each of the eight parts of the book begin with pertinent, thought-provoking, often lovely quotes from sources as varied as Antoine de Saint-Exupéry and Shakespeare to song lyrics from Eurythmics, Christina Aguilera and David Bowie, who's song "Space Oddity" and the character from the song, Major Tom, are a major thread in Wonder. Another interesting fact, RJ Palacio worked most of her life as an art director and graphic designer, designing book jackets for other people! While she did not design the jacket for her debut novel, she does love it. One final thread of Wonder that I really, really loved is Mr Browne, Auggie's fifth grade English teacher, and his use of precepts in his classroom. He tells his kids that, "learning who you are is what you're here to do." Through a series of class discussions and writings, they are going to figure out who they are by the end of the school year and, over the summer, they are even going to make up their own precepts and send them to Mr Browne on a postcard. On her website, RJ Palacio is kind enough to share Mr Browne's (and Auggie's) precepts. Click here to read them! Auggie's precept, especially the way that he comes to it, is my favorite part of this amazing book.